Pantone announced emerald as the color of the year and we are more than ready to fully embrace it. 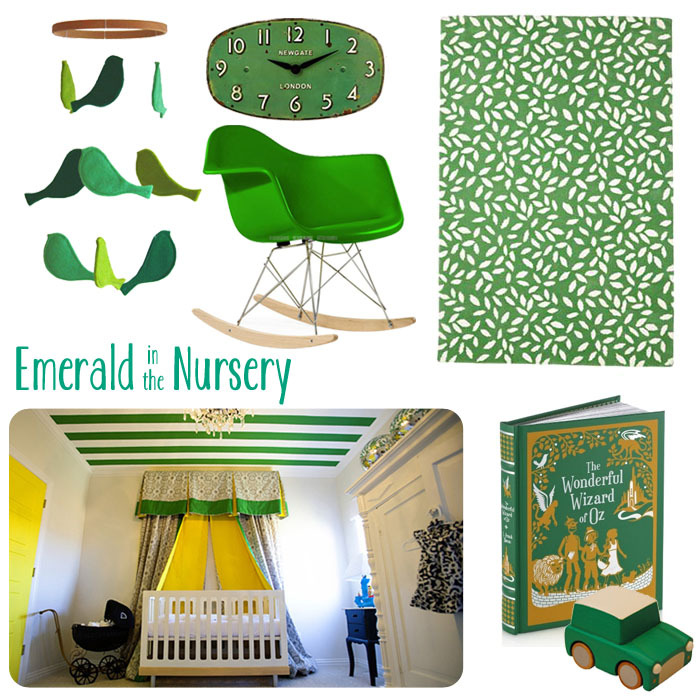 With a new year and new color, it only seemed right to focus on bringing it into the nursery of a new little one. You may not be ready to stripe your ceiling with this lush green, so go for the next best thing, an emerald rug. Rock the color of the year in this mid-century modern RAR Rocking Chair. Incorporate hints of emerald by hanging a vintage-inspired clock on the wall, or a handmade bird mobile. This wooden car would look so cute on a bookshelf with an emerald copy of The Wonderful Wizard of Oz. When in doubt, click your heels three times and repeat, there’s no color like emerald, there’s no color like emerald, there’s no color like emerald! Gorgeous. Makes me want to paint my daughter’s new bookshelf emerald instead of white and give her a whole big girl room makeover. Dammit.